Mozilla upgrades Firefox: More processes, please! Mozilla this week continued its years-long campaign to make Firefox more technologically competitive with the competition, Google's Chrome in particular, by boosting performance, increasing stability and reining in memory consumption. The open-source developer also patched 31 security vulnerabilities, three of them rated "Critical," the firm's most serious ranking. Firefox 54, released June 13, expanded on Mozilla's multi-process project, code-named "Electrolysis" (shortened to "e10s"), that since 2009 has tried to mimic Chrome, and separate the browser's operation into more than one CPU process. 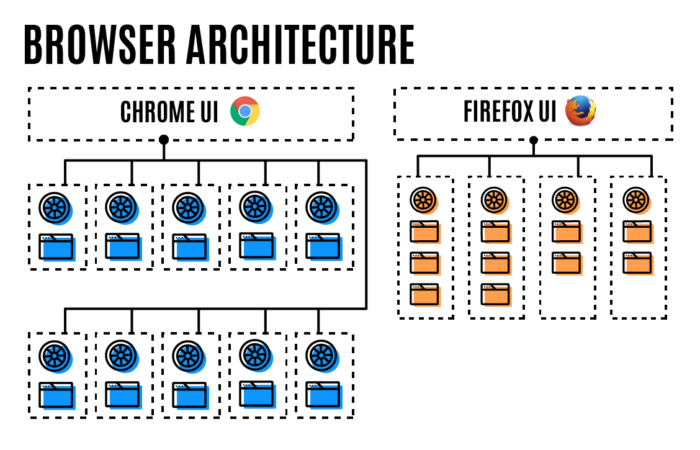 Previously, Firefox split its user interface (UI) and all content into separate processes -- running all tabs in one of those processes -- to prevent the browser from completely crashing when a website or web app failed. Firefox 54 uses up to four processes to run the browser's tabs, assigning each to one of the CPU buckets. "By separating the tabs into separate processes, we make better use of the hardware on your computer, so Firefox can deliver you more of the web you love, with less waiting," assured Nick Nguyen, the product lead for Firefox, in a post to a company blog. In the same piece, Nguyen bragged that version 54 was "the best release of Firefox ever." Because operating multiple processes bloats a browser's memory consumption, and also because Firefox pre-e10s was extensively criticized as a RAM pig, Nguyen asserted that version 54 uses "significantly less RAM" than rivals such as Chrome, Apple's Safari and Microsoft's Edge. Elsewhere, Ryan Pollack, a product marketing manager at Mozilla, argued that the four-process limit is the correct compromise between low and high memory use. He even cited the Goldilocks and the Three Bears fairy tale to declare that the balance between performance (lots of processes) and memory consumption (few processes) is perfect. "Firefox uses four content processes because it's the 'just right' number for many Firefox users," said Pollack. "With four content processes, your computer should have plenty of memory left to run apps besides Firefox." Chrome has relied on a multi-process model since its 2008 launch. Because it devotes a separate process to each tab, and each process requires memory, Chrome generally consumes much more memory than other browsers. (Safari uses a similar, but not identical, multi-process model that ultimately eats less RAM than Chrome. Edge, too, uses multiple processes.) So, it wasn't surprising that Pollack compared Firefox 54's memory appetite primarily to Chrome's, and charged that in a 30-tab test the latter required up to 2.4 times the RAM of Firefox. Users with devices boasting larger amounts of RAM -- more than 8GB, Pollack said -- can boost the number of processes Firefox 54 consumes by typing about:config in the browser's address bar, then changing the number for the dom.ipc.processCount setting. While e10s has been a focus of Mozilla engineers for two years, the project also illustrated how far Firefox had fallen behind other browsers, notably Chrome but even, in areas, Edge. Mozilla has suffered several massive defeats in recent years, including a drubbing over mobile operating systems and a lesser beating from a stab at in-browser advertising. Lately, it has rededicated itself to Firefox, but the jury remains undecided, with some, including a former CTO, maintaining that the browser has no chance of unseating Chrome. Last month, Firefox accounted for 12% of all browsers used worldwide, about a fifth of the share owned by Chrome and half that of a combined Internet Explorer (IE) and Edge. That May number was the highest of the year so far, but it was also nearly identical to Firefox's share of 24 months earlier, showing how mired the browser had become. End users and IT administrators can download Firefox 54 for Windows, Mac and Linux from Mozilla's website. Existing users' browsers will be automatically upgraded. Mozilla argued that its model for Firefox -- use fewer processes to render tab content -- not only means a smaller RAM footprint than Chrome's, but is the smarter approach.